Singaporeans have always had a love affair with food. One of the favourite pastimes of Singaporeans is seeking out and dining at new and exciting establishments. We are home to a plethora of cuisines, with authentic Indian, Chinese, Malaysian, Thai, Indonesian and other South East Asian eateries aplenty. Singapore even has its own signature dishes like rojak, chicken rice, bak kut teh and Peranakan food. Furthermore, with such a significant community of expatriates and foreigners working and living in Singapore, there are also lots of restaurants offering international cuisines like Japanese, French, American, Brazilian and Russian. Many individuals have sought their fortunes in the food and beverage industry (F&B) and started a restaurant, café or eatery. Others start businesses to support this burgeoning industry by supplying them with the materials and equipment they need. While this is an enticing and exciting business for many aspiring entrepreneurs, it is also an industry that everyone knows is very challenging. For every successful restaurant, there are also many examples of failed F&B businesses. First-time and inexperienced F&B business owners appreciate just how challenging it can be to start a business. They have to first find capital to start their business, which can be very hefty. For example, the business will require a great deal of kitchen equipment, renovations and a buffer to help fund the restaurant’s operations in the initial months. To complicate matters, starting an F&B business requires business owners to deal with legal formalities since the industry is heavily regulated by the government. 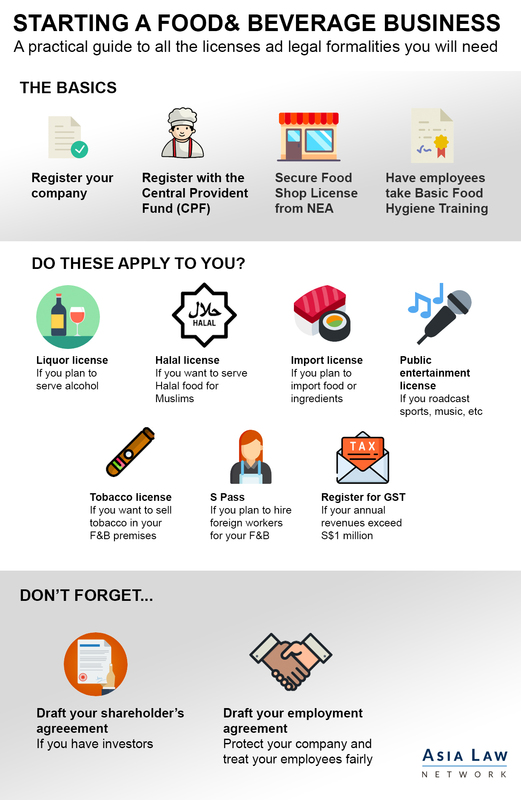 There are licenses (e.g Halal license, liquor license and food shop license) to secure along with the usual bevy of legal fundamentals that every business needs to get started like registering your business and getting your key contracts in place. Despite all this, there are still many new F&B businesses starting (and shutting) in Singapore every year. If you plan to start your new F&B business, you’ll want to get the legal formalities out of the way properly, quickly and affordably so you can focus on the other parts of your F&B business. So, what licenses are required? Not all licenses will apply to all F&B businesses, so it’s a great idea to carefully review your business model and figure out which are the necessary licenses for you. There are a few that are compulsory for all F&B businesses, while others only apply to a specific type of F&B. Keep in mind that securing these licenses may not be a simple task of just applying for them – you might be required to spend additional resources and funds to make sure that you are in compliance with the relevant standards. This may mean investing in additional renovation for your F&B premises. Incorporation (ACRA) All F&B businesses The application is usually processed within 15 minutes after the name application fee is paid. The first step is to incorporate your company on Accounting and Corporate Regulatory Authority (ACRA). After you have registered your company, suppliers and vendors will then recognize you as a legitimate business interest and do business with you. This is relatively easy and affordable in Singapore. Next up, you’ll very likely need to hire workers such as kitchen and serving staff. Most restaurants employ a mix of local and foreign workers since it is more cost effective, and there is a shortage of labour for this specific industry. You’ll have to register as an Employer with the Central Provident Fund (CPF) so you can start hiring legally. This is a step that every business, not just F&B businesses, have to go through to get operations started. If you plan to hire foreign workers as well, you may have to take additional steps to secure an S-pass for your foreign workers. All food retail establishments must have a Food Shop License issued by the National Environment Agency (NEA) to be sure that they comply with the Code of Practice of Environmental Health (COPEH) and operational requirements for food shops including minimum kitchen size, refuse management, noise and cooking fumes control. You’ll want to start on this early since the inspectors may require you to make changes to your restaurant or food shop that may require additional renovation which means additional time and cost to you. After this, you’ll want to make sure that your employees have the Basic Food Hygiene training done. Singapore is a stickler for cleanliness of F&B establishments, so you will want to make sure that you are covered here. Restaurants are all required to display their cleanliness rating clearly. Sending your employees for this training should be relatively inexpensive and cost $100-$200 per employee and is not too time-consuming. After you’ve got the basics locked down, you’ll now need to review if you need any additional licenses. This will depend on the type of food you want to serve (e.g. Halal, tobacco, alcohol), if you will import any food and if you will provide any entertainment. If your business has achieved more than S$1M in revenue in the last 12 months, you will have to register your company for Goods & Services Tax (GST) with the Inland Revenue Authority of Singapore (IRAS). After you’ve registered, you will be required to charge GST to your restaurant’s customers which will be used to offset what your business pays for supplies and ingredients. Note that even if your business has revenue of less than S$1M, it is still possible to voluntarily register for GST. While you’re getting these legal formalities done, you should not neglect other important legal documents for your F&B businesses. You will want to spend some time and money engaging a lawyer to make sure your shareholder’s agreement is well drafted (if you raised funds from other shareholders) and your employment contracts sufficiently protect you while treating your employees fairly. You might end up building a very successful F&B business only to have it crumble because you did not safeguard the business’s continuity with the right legal contracts. If you need legal business advice for your business, you can get a Quick Consult with Kah Hee or other lawyers. With Quick Consult, you can check out in minutes and for a transparent, flat fee of S$49, the lawyers will call you back on the phone within 1-2 days to answer your questions and give you legal advice. This article is written by Lau Kah Hee from Derrick Wong & Lim BC LLP and edited by Gabriel The from Asia Law Network. Kah Hee is actively involved in commercial litigation, arbitration, as well as immigration law, employment law, corporate compliance and governance. He also has experience advising and acting for various parties in contractual, commercial, corporate, banking, property, employment and financial, investment related disputes. In the areas of corporate compliance, Kah Hee's practice includes bank fraud investigation, defence against government/regulatory investigations and white collar criminal matters. 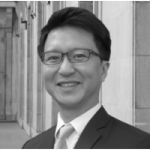 Kah Hee has experience in contentious tax matters, and given his dual qualification as both an Attorney as well as a Chartered Certified Accountant, he has developed a deep interest in tax litigation and advisory work, and has published in the area of tax avoidance. Starting a business? Here are some considerations!